As I mentioned the other day after a slew of backlash after selecting films that are going straight to streaming from Netflix to compete in competition that the Cannes Film Festival has officially changed the rules as to how they affect Netflix films. The history of the Cannes Film Festival lays a groundwork that any film selected for the festival will also have, at the least, a French theatrical opening. The Netflix films selected for this years edition will be able to proceed as planned, but in every following year any film (even from Netflix) will be required to have some sort of theatrical release. The Meyerowitz Stories is one of those films. I am really interested to see what the cast will bring to the red carpet at the festival. Emma Thompson isn’t usually one of the most fashionable stars on the red carpet, but I am hoping that the glamour of Cannes rubs off on her and that she delivers two really major moments. 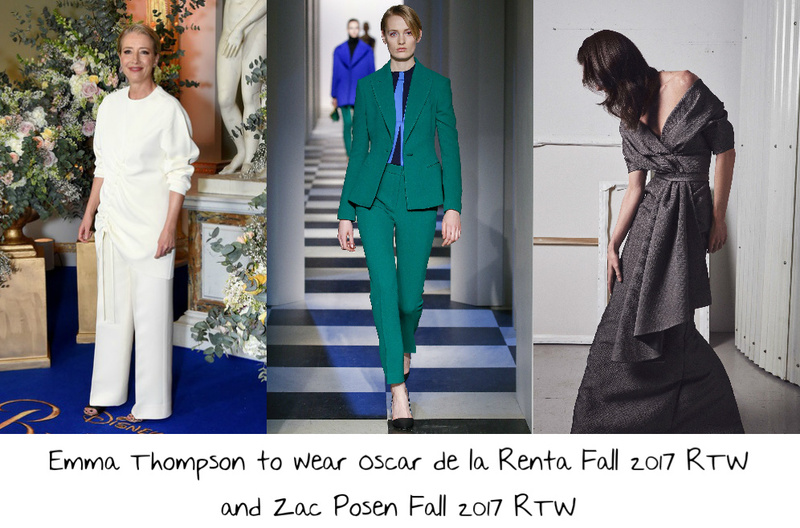 For the photocall for The Meyerowitz Stories I would love to see Emma step onto the stage wearing this emerald Oscar de la Renta Fall 2017 RTW fitted suit and two tone blue stripe knit shirt. This look is everything chic and sophisticated about Emma’s style and bold and colorful which makes it the perfect look for a Cannes photocall. For the premiere I went with a much more glam look with this anthracite grey Zac Posen Fall 2017 RTW jacquard gown which features an off the shoulder neckline, draped bodice and sleeves, and a column full length skirt with a ruffle design at the front. This dress is pretty standard in its style but I do think that Emma would look ever so chic wearing it on the red carpet of this years festival. Styling this look with a romantic updo, lined eye, red lip, diamond cluster earrings, a pair of black satin pumps, and a simple yet dazzling diamond necklace would ensure that this is a beautiful night for Emma on the Croisette. 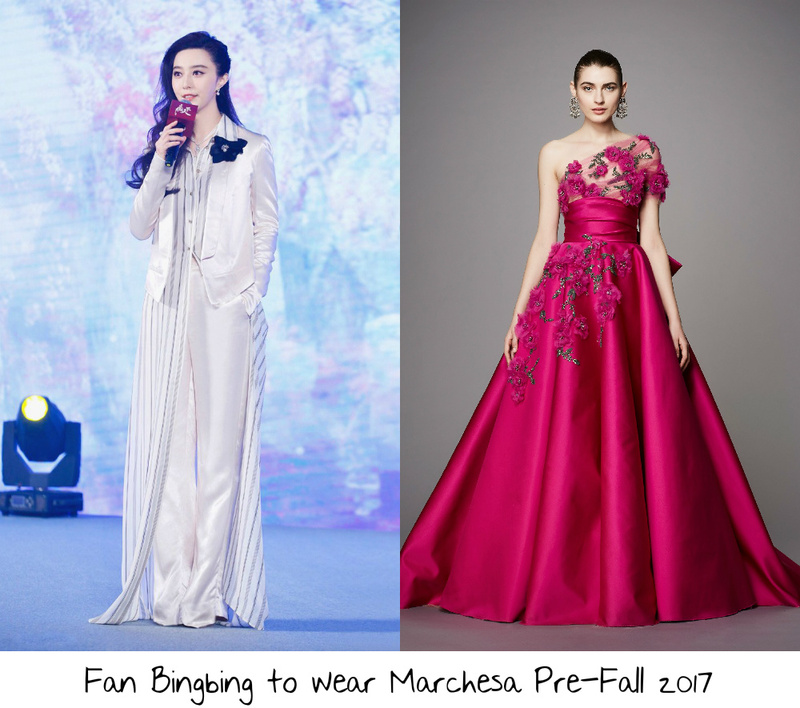 Upon her arrival in Cannes yesterday Fan Bingbing had already worn two looks. One to arrive at the airport in Beijing for her flight to Nice and another when she was spotted leaving the Nice airport. I am hoping that Mrs. Bingbing will deliver one spectacular look right after another over the course of this years festival. I think that Fan would look absolutely beautiful wearing this hot pink Marchesa Pre-Fall 2017 one shoulder satin ball gown which features an asymmetric neckline, and 3-D rose embroidery. This is a beautiful gown and a bold yet feminine statement and I do think that Fan would really bring this confection to life on the red carpet at some point during the course of this years festival. I would love it if jury members would show up for the premiere for The Meyerowitz Stories just to help elevate the glamour. A romantic updo, lined eye, hot pink lip, diamond cluster earrings, and a pair of hot pink lips would really make this another perfect moment for Fan during her jury run during the 2017 Cannes Film Festival. 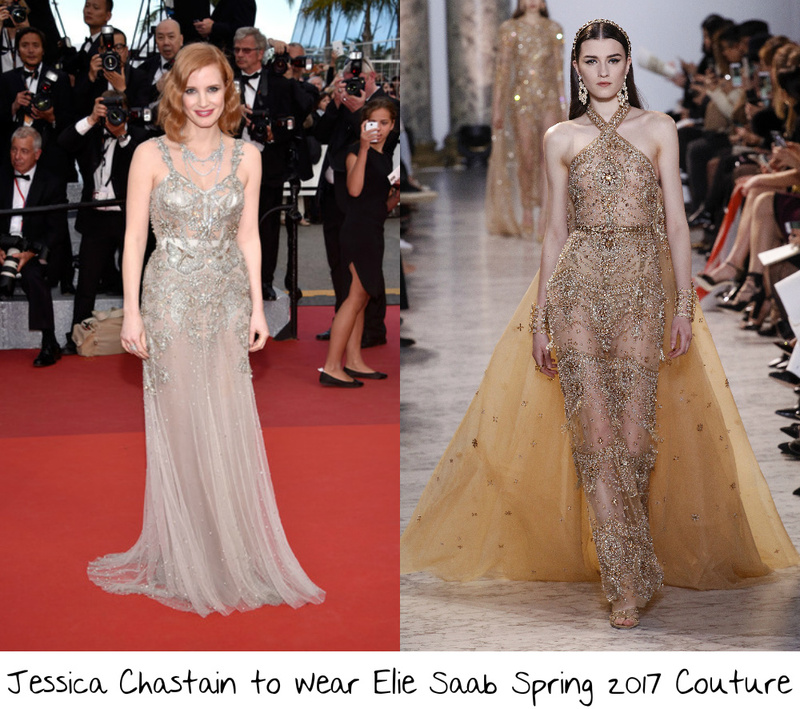 I have gone for mostly simple silhouettes for Jessica Chastain to wear during her time as a jury member during the 2017 Cannes Film Festival, but here we have a little bigger of a gown than the rest. I think that this gorgeous gold fully beaded halter gown which features a column silhouette and a dramatic embellished organza train would be another major moment for Jessica to wear on the red carpet at the festival this year. Jessica look gorgeous in gold so I am expecting her to wear at least one look from this collection on the red carpet during the course of the festival and I think that this one is the most Jessica out of all the gowns in this collection. A loose updo, red lip, yellow diamond cluster earrings, and a pair of gold sandals would ensure that this is a beautiful moment for Jessica. The 2017 Cannes Film Festival opens today and will run through Sunday May 28, 2017. The premiere of The Meyerowitz Stories will take place on Sunday May 21, 2017.